Dorothea Mary Pfister Nordstrand, my grandma, passed away the morning of May 16. She was 95 years old. She was an incredible person, a lot of people have been touched by Gma. It is difficult when I remember that I will not see her again. There is plenty to appreciate about Gma, one is her writing. Her writing voice is wonderful as I got to know and appreciate her work when she started to really crank out articles and stories in her early 70's. She showed it was never too late and she wrote wonderfully. You can tell she had fun remembering places, events, travels, family members, friends, neighbors, plants, pets, ducks and a certain bug hiding out in someone's ear. She also researched and wrote history articles. 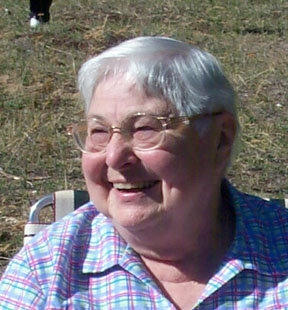 Gma knew she has given us a gift that keeps on giving, in her compositions. She also has given us the gift of her love and friendship. In our memories, her stories and who we are, her voice (or laughter) is still here with us. You can visit Dixie Press to enjoy her collection of stories and see exactly what I'm talking about. The kids, hanging out in between Skyler's flag football games on May 7th. At Goddard Space Flight Visitor Center in Greenbelt, MD, May 14th. Orion's getting more experienced with the cereal puffs. I noticed that if a puff is in the palm of a hand, he'll bring his other hand to try and pick the puff with his pincer grasp. Orion will eat nearly any baby food, with the exception of green beans as some of you may remember. So, we've been picking up combinations of baby food fruits or vegetables for him to eat. I can see that if Orion could, he'd be crawling all over the place already if it weren't for his neck. I can say his arms are getting stronger, his neck's improving but just not there yet. He'd get up on 5 points using his head, hands and knees. He'd either go back down and go up again or roll over. The 12-week goal has passed by for him wearing his STARband. The cranial specialist and I agreed we should go another 4 weeks when we last visited her on May 2nd. 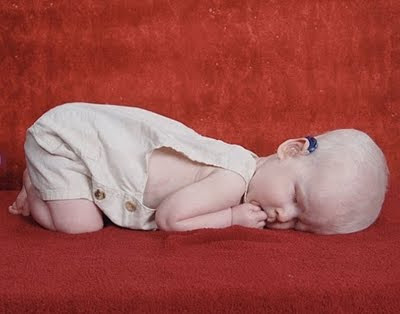 His cranial asymmetry on May 2nd was 8.6mm, he started out at 17mm. The goal is 6mm or less. It's hard to keep the STARband on Orion with all the warm weather we've been having. He'd cry until we take the band off. Poor baby. We're fortunate we started out wearing it nearly full time in early February. Orion KNOWS when I'm going to put the helmet on. I put the helmet on his chest, he brings his hands to the helmet, I sign helmet on his head (with one hand)... he starts crying right away each time lately! We saw Orion's ocularist on April 26th. The ocularist will add more volume to make Orion's scleral shells bigger, thicker since his sockets have grown. Instead of adding on to Orion's current painted shells, he'll make new clear shells like the ones he started out with. Orion's real eyes are fascinating to me, I think they're cute. At the same time, I also want to make sure Orion gets all the access to light as he can. His painted shell has a clear pupil, yes, but I noticed his real pupil/iris of his left eye is not usually lined up with the shell's pupil so I figured he wasn't getting his light. It's not the ocularist's area to determine if Orion's getting light, that's the ophthalmologist's area. His ophthalmologist says Orion doesn't see anything. So here goes this mom, to make sure the opportunity is set up for him to look for light if he can. I will bring Orion to the National Eye Institute at NIH in Bethesda, soon. Orion's microphthalmia is right up a certain doctor's/deparment's alley researching eye diseases of children. Talking about eyes, Orion's dad, Thomas had a retina detachment in April and went into emergency surgery (vitrectomy) on April 15 to reattach his retina. What was supposed to be 2 hours or less took the surgeon 8 hours! Thomas came out to the recovery room at 2:30 a.m. on Saturday. It took us around 3-4 hours to wake him up and get him in the car. He didn't really wake up until his brother Dale, who was at our home watching the kids, and I set him down on the couch. Now, remember, he's thinking it was a 2 hour surgery, that it's still Friday night so you can imagine his bewilderment when we told him he had to go to a post-op appointment with the surgeon at 11 a.m. Saturday... in a few hours! How did we tell him? Tactile signs. It was slow communicating. Thomas' vision his his left eye is not usable after multiple surgeries 12 years ago to reattach his retina/fix tears. So, with his right eye, he rested a lot. His eye looked the same or worse than a boxer's eye swollen shut. He kept his head down, facing the ground for 7 days so it'd heal properly with the support of the gas bubble injected in his eye. You could say we had 2 deaf-blind individuals in our home during that 1 1/2-2 week period. We got insight on what it's like for Orion. It's so easy to leave a deaf-blind person out of the going ons around him. As for entertainment, Thomas was easily bored because we're all visual-dependent. Not in Orion's case, we understand he'll have access to entertainment, interaction in his own way. It has been a very, very interesting 1 1/2 months... a whole 'nother story. We are so very grateful for the individuals who offered their time and help. It was a humbling experience and HUGE help to the family. Thomas is still on leave from work as his vision has not improved enough for reading with the ease he used to have. Forget about driving. For now, I'm still the family chauffeur. One last thing, as there still are plenty more to share, I got a called in for jury duty to happen in late May! In early April (before Thomas' detachment) I wrote a letter to the Clerk of the Circuit Court asking to be waived as I was the sole caretaker of 2 non-school aged children and one of them was deaf-blind and couldn't just be dropped onto the lap of just any babysitter. Request denied! What?! Unbelievable. So I went to work and got 2 doctor's notes- one from a pediatrician and one from Thomas' ophthalmologist and stuck that in with a 2nd letter, this time to a jury judge. Hope it works this time. I've always been curious what it's like showing up for jury duty, but come on, they got to me 6 years too late! Labels: eyes, helmet, ocularist, physical progress, shell, Thomas Sr.
Orion is 9 month old in this photo. It was a warm April day. While discussing Orion with a group of Deaf people, a woman wanted me to clarify what his disabilities were, so she said, "Orion's blind, what else?" "He's also deaf, " I say. April 10, 2011- We went to CHCDP's Eggstravaganza event at Gallaudet. Orion felt grass for the first time. He tolerated laying on the grass but kept his hands and legs up. 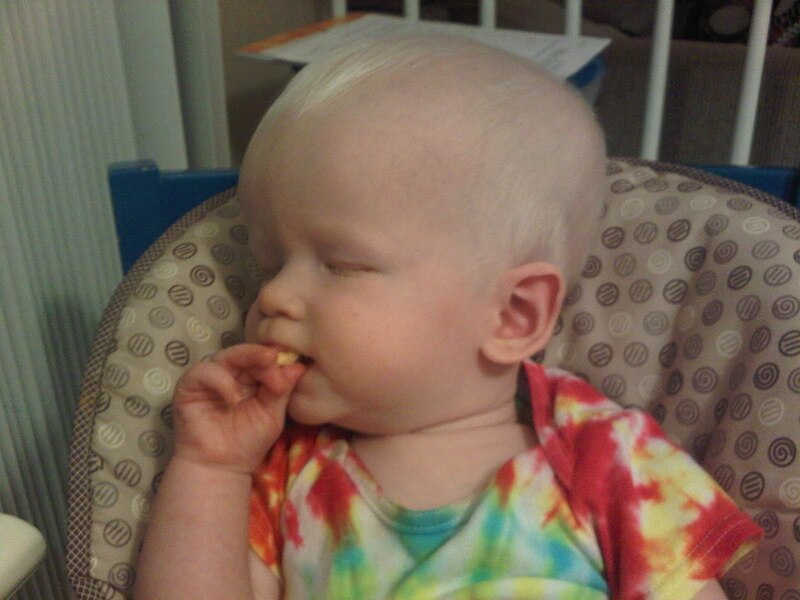 April 14, 2011- While laying in his stroller, Orion checked out a yellow dandelion with his hands. This was at Skyler's first flag-football practice. Soon enough, we had to rescue this dandelion from his teeth. 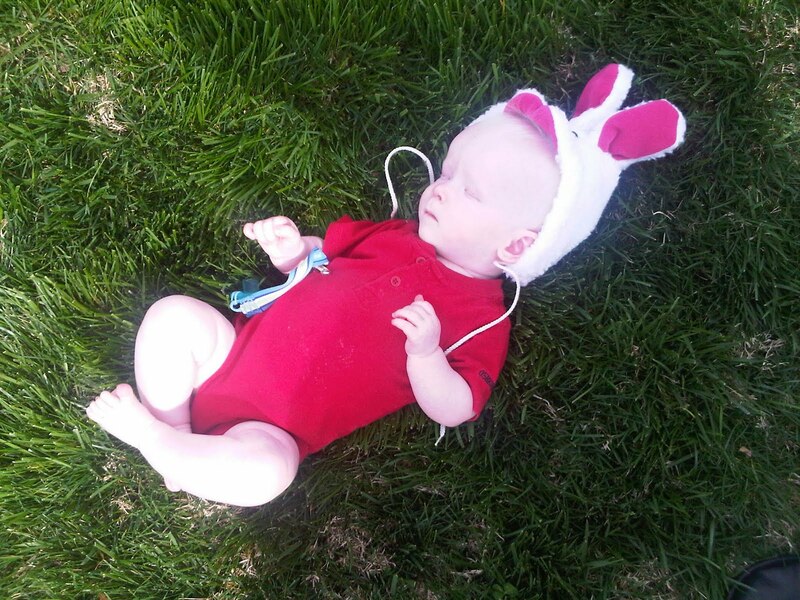 April 20, 2011- (Orion is 9 months old.) Orion was introduced to the lilac bush out at our mailbox. I could smell its heavenly blossoms, I'm sure he did, too. He grasped the blossoms and leaves tightly and pulled it to his mouth. I was thinking to myself I need to check out what plants are toxic and what would be OK to taste. If he could taste one leaf maybe he'll learn through taste why we don't eat leaves... unless he has he soul of a deer? May 4, 2011- (Orion is 9 1/2 months old.) 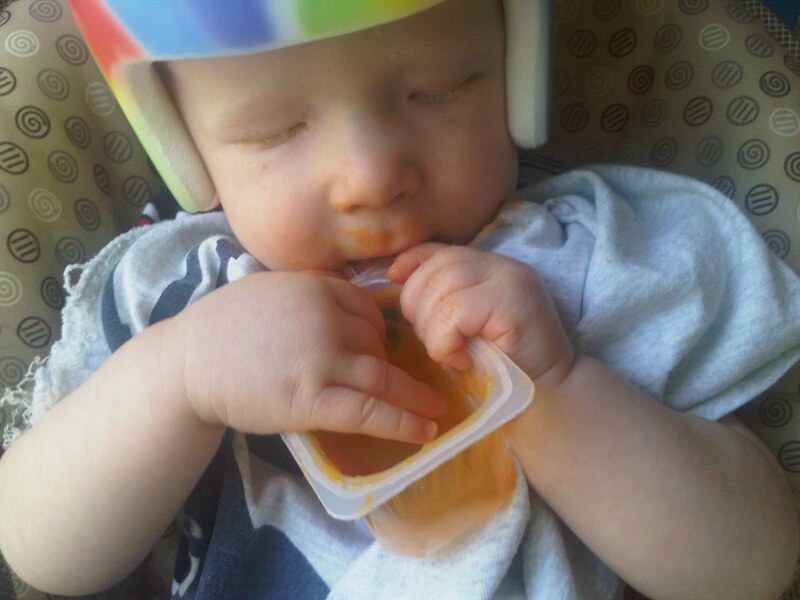 He held the baby food container in his hands and checked the outside of it with his tongue. He also discovered and grasped the sweet potato puffs on the highchair tray. He managed to get one puff in his mouth. That lone puff had an 'interesting' journey from tray to mouth... taa-daaaa. Today's the official day Orion 'feeds' himself for the first time! Yay-yay-yay!